The Hydro + Caffeine Cola flavoured effervescent tablets with added caffeine ensure you are effectively hydrated and provide a mental boost. 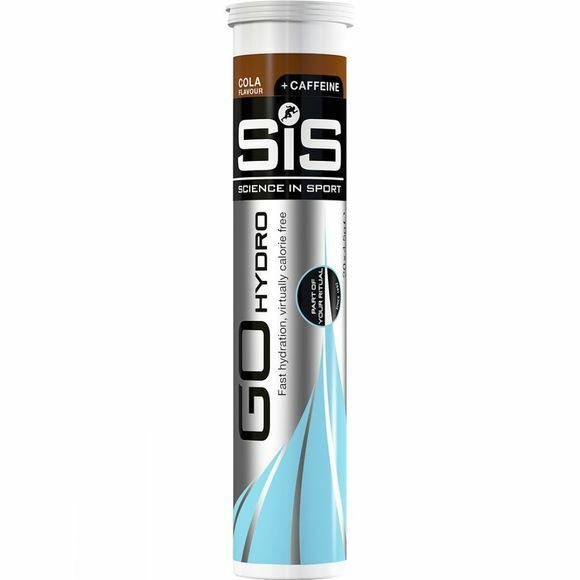 SiS have designed the tablets to ensure you are effectively hydrated, resulting in peak performance. As an effervescent tablet that readily dissolves in plain water, it represents a highly practical approach (simply drop one tablet in your 500 ml water bottle) without the calories to meet your sodium requirements at a specific concentration (30mmol/L). Electrolytes (34%) (sodium bicarbonate, sodium chloride, calcium carbonate, potassium chloride, tricalcium maltodextrin, flavouring, colour (caramel E150d), caffeine, starch, sweetener (sucralose), vitamins (pyridoxine hydrochloride, riboflavin 5-phosphate, thiamin hydrochloride) phosphate, magnesium carbonate, zinc citrate), citric acid, sorbitol, inulin.